Fellow Lush addicts know that it’s damn exciting when the seasonal products come out. 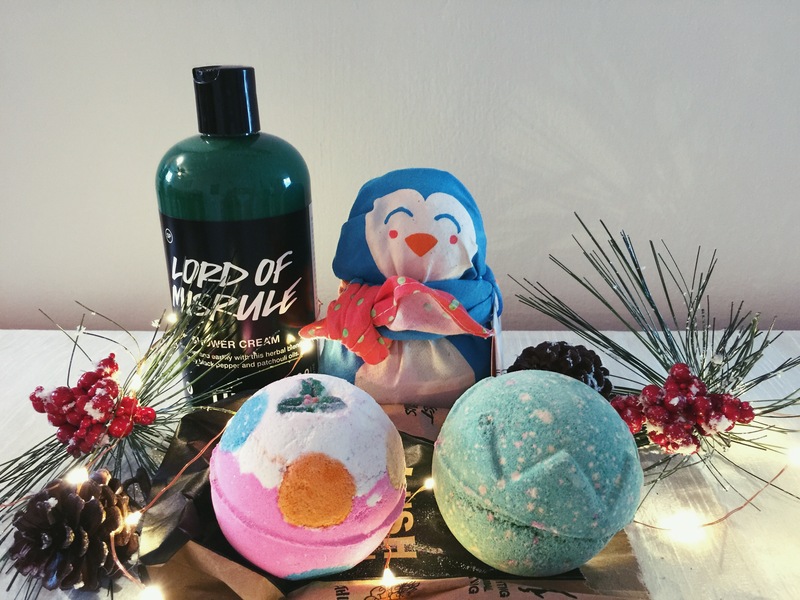 Personally, I can’t get through the holiday season without some Lord of Misrule in my life. Lush’s products are vegetarian, handmade, and aren’t tested on animals, can’t go wrong. Check out what I picked up from the Lush Christmas line! I’m always sad to see this scent go, but I’m always so excited to get my hands on it! This is a shower cream, so you’re getting clean and moisturizing at the same time. It’s a gorgeous shade of festive green with black pepper, patchouli, and vanilla. I’m obsessed with the smell, it’s a bit spicy while still being sweet. This one I bought as a gift because I just couldn’t help myself! I love that she comes with two different bath bombs, one for soft skin and one for relaxing. Plus, two bath bombs wrapped up to look like a penguin is just adorable. I haven’t tried this yet, but it smells just lovely! I grabbed this particular bath bomb because the featured ingredient is lavender oil, which sounds lovely for a nighttime bath. It’s promoted to get rid of tension and help you relax and sometimes during the holidays, you need just that. No-brainer. Need the shower gel, need the bath bomb. Need this scent during the holiday season. I didn’t expect this to turn my bath water pink, but delightfully enough it did! I came out smelling wonderful. 10/10 would recommend anything in the Lord of Misrule scent. I’m not big on bath bombs, more of a shower person, but gosh Lush bath bombs always look so divine. I have never bought any of their Christmas specials, I tend to stick to the stuff I already have (mainly to stop myself from spending too much money) but that shower gel looks pretty great. And the fact that they refer to it as shower cream makes it sound all the more appealing to me. Nice blog by the way. Would you be interested in sharing your thoughts and opinions on Creators.co? I’d love to see more of this kind of content on the platform as we continue to branch out. Feel free to shoot me an e-mail for more information. You can find my contact details on my blog. Hope to hear from you. I can’t recommend Lord of Misrule enough! I just love it. And thank you!